Siemens PEM (proton exchange mem- brane) fuel cells as part of the integrated propulsion arrangements for the navy's new 212-class submarines. Now, classification society Germanis- cher Lloyd has taken a lead by establish- ing guidelines for fuel cell propulsion and power systems. Drawing on 13 years' experience with projects relating to submarine fuel cell installations and hydrogen-handling equipment for gas tankers, GL is offering services in fuel cell system and ship plan approval and classification, safety assessment, com- ponent certification, project definition, ship design and expert evaluation. In 2000, the society certified a German inland water excursion boat incorporat- ing fuel cell propulsion, the first non- military craft to be so equipped. The concept has appeal for marine applica- tions since it raises the prospect of power generation with improved effi- ciency and, above all, considerably reduced environmental pollutant release compared to conventional arrangements. Fuel cells generate electrical power by combining hydrogen with oxygen, with- out open flame combustion. The hydro- gen can be obtained from methanol, nat- ural gas, petroleum or renewable resources. 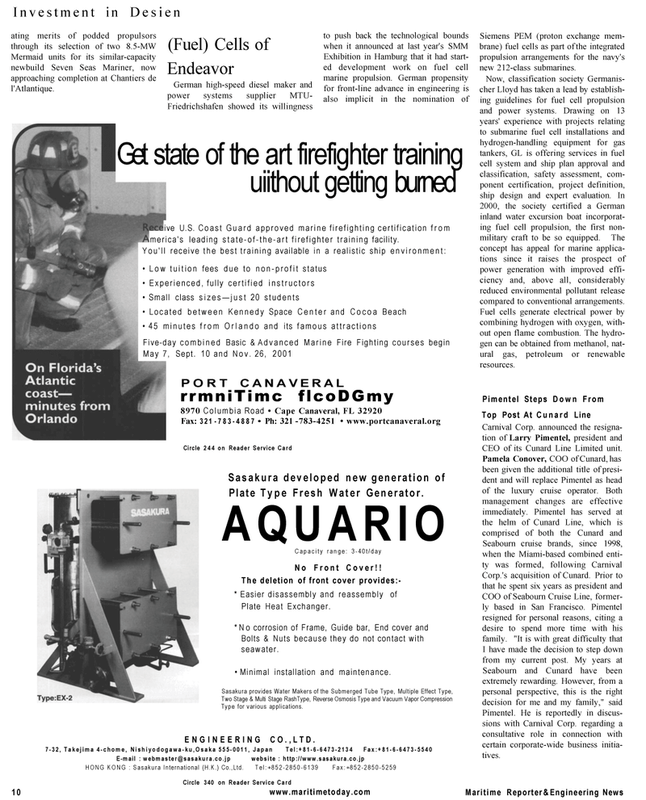 Get state of the art firefighter training uiithout getting burned ive U.S. Coast Guard approved marine firefighting certification from merica's leading state-of-the-art firefighter training facility. CEO of its Cunard Line Limited unit.